DATE & TIME: November 14 & 15, 2015. Saturday 9am - 4pm, Sunday 9am - 5pm. COST: $265.00, which includes materials, group and one­-on-one instruction, and Saturday lunch. Learn the ancient techniques of repousse and chasing to give life and three dimensions to a flat drawing and a piece of sheet copper. There will be a starter drawing for Students to learn from or with instructor approval the student's own drawing may be used; student's drawing must be approved prior to class - for approval email Heather at steelcrazy@roadrunner.com at least two weeks before the class. Students are encouraged to bring a smallish (1-2 pound) ball pein or chasing hammer. If you have a heat gun or plumber's torch, that would be helpful, also not required. 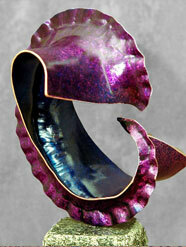 Working in copper, you will learn some of the basic techniques of Foldforming using the plasticity and elasticity of the metal to create 3-D pieces of art. Bring a favorite small hammer or two.